I have been on quite a culinary journey this fall. I recently finished taking a class on Weight Management through the Nutrition Therapy Institute. One of the projects for the class was either to do a client case study focusing on weight management protocols, or to develop a protocol for myself. Since I had a good 25 pounds of baby weight yet to lose at the start of the class, I chose the latter option. As I progressed through the reading material and coursework, I decided spontaneously to eliminate gluten, as well as most other grain-based starches and sugars, from my diet and see how I felt after reading the first few books for the course. I did it without advance planning or purchasing “gluten-free” products, simply by eliminating most grains from my diet and replacing them with larger portions of meat, fish, fruits and vegetables. If I had spent too much time planning to go gluten-free, I feel certain I would have chickened out because I love bread, pasta and pretty much any baked desserts. I have actually pondered going gluten-free for the past several years, mostly because we removed gluten from Nolan’s diet for 6 months; however, psychologically, I was never able to let it go until now. I was honestly surprised at how easily and organically the whole process occurred given the right information as motivation. I had several personal reasons for going gluten-free. First, I had been unsuccessfully attempting to increase my daily intake of protein at the expense of carbohydrates rather than healthy fats, leading to a macronutrient ratio that I felt would be more supportive of sustained breastfeeding. Also, since Nolan was prone to yeast overgrowth since infancy (thrush in mouth and yeast diaper rashes while teething), I wanted to limit any foods in my diet that might contribute to yeast growth in myself or in the new baby. Additionally, I wanted to select a program that would be restorative for hormonal balance, as my hormones are still in flux after the pregnancy. Gluten as we know it in modern wheat and other grains causes gut permeability in 100% of people, regardless of whether they have celiac, non-celiac gluten sensitivity, or not. Even people with perfect digestion have increased intestinal permeability for about 5 hours after consuming the protein gluten, encouraging the release of zonulin, which gives other proteins a way into our bloodstreams to wreak havoc. This can eventually lead a whole range of autoimmune conditions, including not just celiac, but also rheumatoid arthritis, Hashimoto’s thyroiditis, and multiple sclerosis, to name just a few. Grains are a desperation food. What I mean by this is that we first started cultivating grains in order to see us through times of famine or starvation, because they were easy to transport and store, and could provide us with energy in times of poor hunting. Hybridized wheat crops likewise have saved millions of people from starvation in third world countries. But everything about grains is designed to prevent us from digesting them successfully, from their hard indigestible hulls to the anti-nutrient phytic acid which binds up minerals. It takes a huge amount of work to prepare grains properly for digestion, and they aren’t even necessary for our survival. If we have access to high quality proteins, fats, fruits, and vegetables to provide all the nourishment our bodies need, why should we content ourselves with the sub-standard calories and nutrition in grains? I was impressed by how easily I was able to navigate eating at restaurants with this dietary restriction. My mom and I have a standing lunch date on Mondays, and I was not tempted at all by the bread baskets or desserts. I found it interesting to get a sense of which restaurants were truly willing to accommodate dietary restrictions, and which ones did just the minimum (eg: allergen list of the regular menu vs. a specially designed gluten-free menu). In Colorado Springs, Hacienda Colorado and Biaggi were positive standouts. I was also surprised by how sustainable this diet was despite cooking for family members who still eat gluten. My husband and son are fond of bread, pasta and muffins, and I was able either to adapt my own meals (baking a spaghetti squash for myself when my husband requested spaghetti and meat sauce, for instance) or make gluten- or grain-free meals that they enjoyed also. As with any type of recipe, we didn’t like every single meal, but we had some big successes. I made several types of grain-free crackers for Nolan based on ground flax and/or almond meal, and both he and my mother loved them. I also made a whole repertoire of low-sugar flourless muffins with an almond butter base that the whole family loved. Since I am the cook in the house, the net result of my diet was that my entire family ate somewhat reduced amounts of gluten, starch and sugar as well. What surprised me most about going gluten-free, however, was not that I was able to accomplish it without cravings or that I could go to a restaurant and pass on the bread basket without hesitation. It was the types of foods I became willing to try to fill in the gaps left by starches in my diet. Avocado became a standard alternative to bread—smashed under tuna or chicken salad for lunch, diced into scrambled eggs for breakfast. I started eating sushi willingly, and sampled fish roe and canned sardines. I tried all manner of Asian foods, including Thai curries. I gobbled down sweet potatoes, chanterelle mushrooms, and lots of winter squash. Most of these foods I would have avoided like the plague before the dietary change (or would use them only in small amounts as a garnish on pasta, for instance), and the fact that I not only started choosing them for myself, but grew to relish many of them, makes me think that gluten was stimulating my appetite in very specific ways that excluded many nutritious foods. The comfort of sugary and gluten-containing foods had hampered my ability to branch out. Since beginning this protocol in mid-September, I have lost 15 pounds slowly but steadily, no more than 1-2 lbs per week. As much as I would have liked to incorporate regular exercise into my weight management routine, time limitations and responsibilities have not allowed more than the occasional walk with Theo on nice days. My mood and energy levels have remained about the same; that is, they are good at least on days when the kids let me have a decent night’s sleep. If I do change anything from here on out, it will actually be to try and eat more calories, especially from animal protein and vegetables, but for the most part I have been eating whenever I am hungry, emphasizing breakfast and lunch over dinner, having one or two snacks during the day, and I never feel deprived. My milk supply has remained steady as well. On most of the occasions when I have wished I could eat something with gluten in it, it was more from the passing convenience aspect of it rather than a real craving. This recipe is just one example of how you can go beyond gluten-free to grain-free without feeling deprived in the least! By replacing the arborio rice completely with butternut squash, you also significantly increase the overall fiber and nutrient content of the meal, including vitamins A and C, B-complex vitamins, magnesium, potassium, and phytonutrients. This could also easily be made dairy-free by the substitution of coconut oil for butter; just don’t omit the fat because it makes all the carotenoids in the squash more bioavailable. In a sauce pot, bring stock to a boil then turn down heat to low to keep warm. In a separate pot, heat the oil over medium heat for 1 minute then add onion. Season lightly with salt and pepper. Cook onions until translucent, about 2-3 minutes, then add the garlic and cook for 1 minute. Add butternut squash and stir to coat with oil. Season lightly with salt and pepper. Slowly add enough stock (approximately 2oz) to cover the butternut squash. Continue to cook and let liquid reduce, stirring often. *From this point, the butternut squash will start to absorb the stock and release its starch. As liquid reduces, add 2oz of stock or enough stock to cover butternut squash. Continue this process for 12-15 minutes or until butternut squash is tender. Once butternut squash is tender, add butter ½ T at a time and mix until fully incorporated. Keep warm. Spoon butternut squash onto middle of the plate. 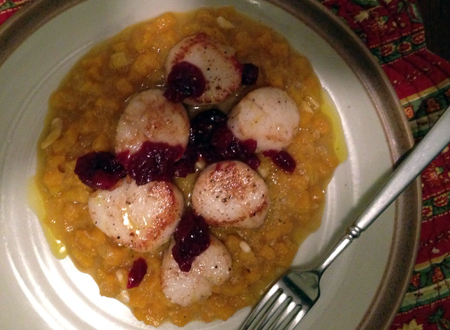 Place pan-seared diver scallops on top of butternut squash and garnish with cranberry compote, Parmesan cheese, and a drizzle of orange-fused olive oil. Source: Adapted from The Morning Blend. Combine all ingredients and simmer together, occasionally mashing berries with the back of a spoon, until cooked through and thickened. The Gluten Summit is over, but a few of the key interviews are still available through the end of January if you want to take advantage of this wealth of knowledge.